I was so happy when I saw that #steemitphotochallenge by @jamtaylor was back! But, I was even happier when I saw the theme of the 1st contest for 2018! 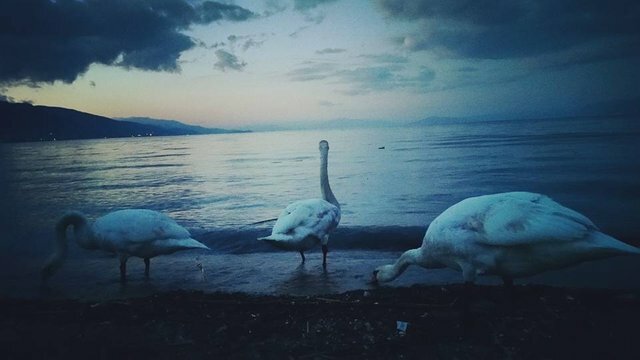 The below picture was taken in Ohrid Lake. I am pretty aware that the quality is not as good as in my other pictures, but sometimes it is more about the mood it reflect and what does it remind you! For me this is pure melancholy! Let me know what you think about it, in the comments. Are you focusing on content and composure, or in quality when you take your pictures? Do you think of capturing the moment? Sometimes when I try to capture moment it does not work out, but with a bit of luck it is possible to grab the moment combined with quality. Those pictures are more precious than super quality photographs lacking the magic of moment. I have mixed feelings bout it...in a way its sorta dirty moody...but i think it depends who looks at it. I like how the middle one is looking in the distance...so yes in first glance id say its a dark picture....but at the end I must say its very peaceful and even filled with hope.